UPDATE: i sold the empty van. the whole build structure is available for sale, or i can sell parts separately like the water pump, water tank, rv-type filling hatch, sink + countertop, shelf, storage cabinet, bath tub with slats (that can hold compost toilet), curtains, hanging closet, etc. i’ve already sold the refrigerator and compost toilet. 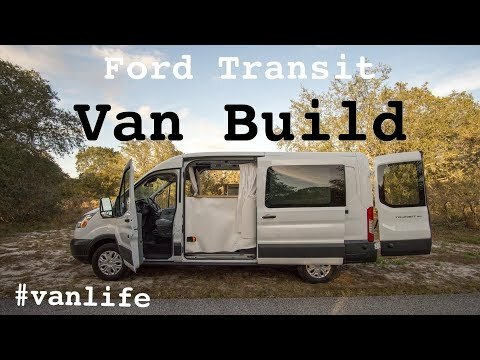 this is a full, detailed tour of my 2017 Ford Transit-150 Cargo Van with Premium Van Package and lightweight campervan conversion build-out. after having a look at what’s in it, i talk about some of the options i chose and why. below are links to some of the components. please use these special links if buying as they help support me in creating content (and you pay the same price on amazon whether or not you use these links). collectively we have the choice to end the seemingly endless cycle of conflict, competition, greed, violence, blame, control, and any other game the ego/mind plays. the more of us that awaken, transform, and experience the flowering of the heart, the sooner we'll see a beautiful new world unfold before us. on the first day of the drive north, i took a detour toward orlando to check out some tiny homes and meet a friend whom i hadn't seen in years. it was nice to see her, meet her husband, and feel inspired to go back to the avatar course in the future. after chatting for a bit, i left to make my way toward my cousin's place just outside atlanta, sleeping in a parking lot between a hotel and restaurant on the way up as it was late and i was getting tired. it was good to take the break, as in the morning i got to see the rolling hill landscape that i would've missed driving at night. atlanta had good food and a nice feel to the city (and neighboring towns/burbs) with winding roads, hills, and many trees that were much more pleasant than a typical city grid. after spending a few days with my cousin, i visited a friend near chattanooga and met her family. we walked the long pedestrian bridge over the river and checked out part of the city, which also had a nice feel to it. i then stopped by the isha center in tennessee on my way toward chicagoland. when i arrived, i was a little surprised when the girl at the welcome center told me i could go to the meditation/ceremony that was starting soon (i thought i had missed it as i forgot i crossed into the central time zone on the way there.. my phone wasn't getting service most of the whole trip so still showed eastern time). the dinner hall was nice as everyone ate in silence. afterward, i sat by a small garden area and enjoyed the peacefulness of the grounds. the next day, i discovered a wilderness preserve on my way toward kentucky and explored there for a bit. i also explored around the land between the lakes national recreation area. i was thinking of staying there overnight though i couldn't find the spot i had discovered a few years earlier, and there was still plenty of daylight left, so i headed toward garden of the gods in southern illinois. i was going to stay there, though i was feeling pretty sweaty as it was a hot day and i had been driving with the windows open the whole day. not having plumbing installed yet, i walked a little bit of the trail, took a few photos, had a snack, and decided to drive the rest of the way to my friend's place so i could shower before going to sleep. i also figured there'd be no traffic driving the small country roads up the state at night. by the time i went to sleep, the early morning light of the next day was beginning to show and i had been up for almost 24 hours straight without a nap. the van build isn't fully complete yet, so the journey was shorter and with less stops along the way than it would've been, though i still decided to take back roads the whole way. i more than doubled the number of miles on the van on the trip up. the trip meter for the drive up read 1547.5 miles with a little over 35.5 hours of driving. per the meter, i averaged 19.7 mpg the whole trip, and i saw right around 22 mpg for the last tank (and when i had cruise control at 57 mph) which i was pretty happy with (though i'll have to determine how accurate the trip meter calculation is). more than once during the trip i had just enough gas to make it to the next town that had a gas station. luckily that last night something told me to call the gas station on my way there (and i actually had a signal to do so).. they ended up leaving the pumps on a few extra minutes for me to get there as they were about to close. i ended up going a couple miles past the 0 miles range left indicator too. if i hadn't called, i would have had to sleep at the gas station all night until it opened the next morning or risk attempting to drive to the next one miles away without knowing if i had enough fuel to make it. sometimes navigation was a bit tricky without a phone signal to download the map data, though besides not finding the one spot in the recreation area (which i didn't remember exactly where it was anyhow), i managed to make my way pretty much on course until i got enough of a signal to find towns that had gas stations. luckily i usually didn't have to go too long without a signal before i got one where i could start the turn by turn directions (which downloaded all the data needed for my route to the next stop, so it'd continue to work even when i lost a signal). it was also nice that the google maps app was able to provide navigation solely via local roads. UPDATE 2019.03.12: i sold the empty van today. the whole build structure is available for sale, or i can sell parts separately like the water pump, water tank, rv-type filling hatch, sink + countertop, shelf, storage cabinet, bath tub with slats (that can hold compost toilet), curtains, hanging closet, etc. i’ve already sold the refrigerator and compost toilet. 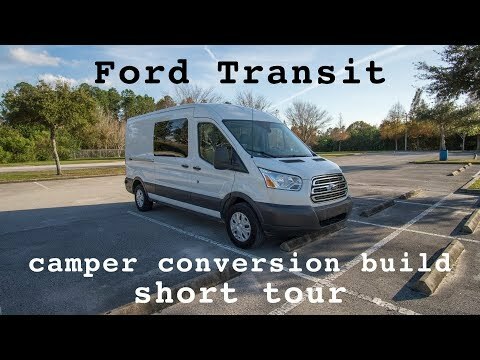 this is a very long + detailed video about the adventure of building a simple camper conversion in my new Ford Transit-150 van. while speaking about the build, i show a slideshow of photos of the build process starting with the empty van and going into some details of getting all the pieces and components installed. i may have left out some details (it was the summer before last when i built it, so don’t quite remember everything at this point). 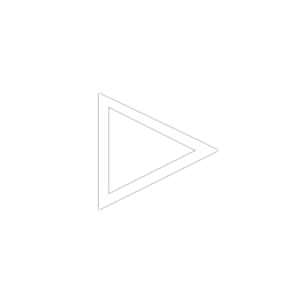 a clickable link is on my profile page. i’ve decided to sell my van so i can put the funds towards purchasing land where i can build a small home or park a tiny home on. i didn’t end up using it nearly as much as i thought i would. i took it on a couple trips north in the summers, and on some shorter trips around florida (where i live). if you can’t make it down here to pick it up, i’d be happy to drive it anywhere in the united states to deliver it to you (if you cover the cost of gas and airfare back). i special ordered this van from Ford to be custom built last year. i did a lot of research and went on multiple test drives before deciding on this combo. i’m working on writing a long, detailed article on why i chose this van and can copy/paste the link to it later. it’s a bit of a rare + unique van to have everything it has. the van has less than 18,000 miles (as of end of december 2018). it does pretty well on gas mileage when loaded with gear + the build. the whole time i’ve had it, i’ve manually calculated the overall mileage to be just over 18 mpg, and have seen as high as 25.7 mpg with cruise control at 50 mph, around 24.5 mpg at 57 mph, and 21 mpg at 65 mph (this includes being stuck in stop-and-go traffic for a little while). here’s a quick tour of it. i’ll be posting a much longer and more detailed video very soon (its got a couple hours of rendering to go and then will have a 22-24 hour long trip to make it to youtube’s servers). if you’re not interested in any or all of the build as you rather make your own floorplan layout (or use the van for work, a higher end build, etc), i can take everything out if you prefer. — the only holes drilled into any part of the van were for plumbing + ventilation (and were done by someone with professional plumbing + construction experience). the main structure is held in place at the cargo tie-down points (and some smaller parts are attached via rivnuts using pre-existing holes). the cost to order the van alone with everything this one has would be $45k with tax/tag/fees/etc and would take several weeks to be built, a few weeks to be delivered, and then several more weeks to build out (and possibly a good number of weeks to research). this van is available today and would save you months of waiting and working. i’m open to reasonable offers from anyone interested in buying it. i didn’t mention above that the van still has plenty of the factory warranty left from Ford. i had someone mention the NADA value, and had a look at the NADA guide online. it didn’t show most of the options my van has (as its only showing the wagon version of the van, not the cargo one that has everything available and built a-la-carte). i looked at KBB’s pricing online and it shows from $28k to over $30k for a similar Transit in good to excellent condition, though with only some of the options. the website is missing a lot of options i have, like the Limited Slip Differential, Dual Heavy-Duty Batteries, Heavy Duty Alternator, CNG/Propane prep package, Windows with Privacy Glass on both sliding doors + rear doors, Level 2 Instrument Cluster (which starting in 2018 is only is available when spending ~$2k on Navigation), High Capacity Upfitter Switches, Auxiliary Fuse box with High Spec Interface Connector, Modified Vehicle Wiring System, Wheel Well Liners, AutoLamp with Rain-sensing wipers, extra set of keys, etc. if you look at all the options that KBB is missing on Ford’s online van builder, you’ll see it’s about $3k worth. even figuring they’re not worth the full value on a pre-owned van, you’re still looking at spending into the $30k’s if you were to find another used van with everything this one has. as i mentioned above, if you enter everything my van has into Ford’s online builder, you’ll see it’s over $40k, and by the time you add taxes, title, tag, dealer fees, etc, you’d be at $45k to buy a new one out-the-door (or closer to $47k if you wanted the upgraded dashboard instrument cluster as it now only comes with the expensive Navigation feature). yes, you could probably get it for a bit less than that if incentives are available, though it’s still gonna cost a good bit by the time you add everything and it would take you months to special order + weeks/months to build out a new van with everything mine has [it’s very unlikely you’ll find another van with all the options mine has sitting on a dealer lot, new or used]. 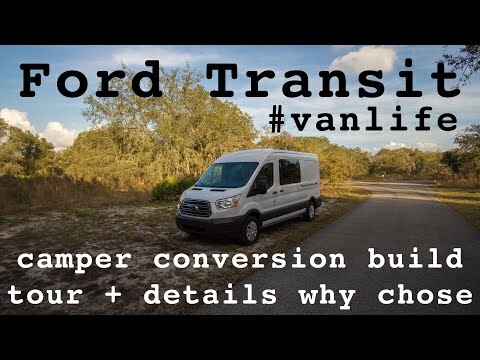 also keep in mind that my van already has all the options it does, and that adding some things afterwards would cost way more for a Ford dealer to order and professionally install than to special order at time of the factory build. i forgot to add to the list above that both the power leather seats are heated. on top of the van price, the components + parts + materials alone for the camper conversion build cost a few thousand dollars, not counting thousands of dollars worth of time and labor to research + build + install. i know the labor part is harder to calculate the exact value, though if you’d do it yourself, figure how much money could you earn working multiple jobs full time from the time you woke up until the time you went to sleep every day for a few weeks or couple months straight, or how much would it cost to hire someone to build a camper van out (and consider how long might you have to wait if its a builder that has a long waiting time, like some that would have months of orders ahead of yours). keep in mind that if hiring a professional builder, they may have minimum build levels and i think some easily start at $20k-$30k just for the build cost (on top of whatever the van you choose costs). the other option to get a camper van would be to purchase a class b rv, though these typically cost at least 2 to 3 times the price of a new van, and can have so much in them that the extra weight will affect performance and mileage (and some models have unhealthy materials that off-gas into the small enclosed space you’re sleeping and living). the value and cost to purchase a new van with everything mine has and with all the components + parts would be over $50k not counting incentives/deals though also not including any of the weeks of time + labor to build it (which could be a good bit). i’ll accept $40k for my van with everything in it, and can consider driving it to you (or keeping it somewhere safe here) if you’re unable to come get it right away. i’ll also consider any reasonable offers (somewhere in the $30k’s) for it. if you want the empty van without any of the components or build, i could take everything out and sell the van to you for $33k. 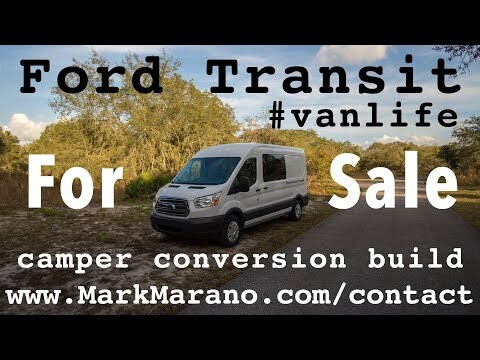 if you already have a van and are only interested in the components + what i built out in my van, i could remove everything out of my van and sell it all to you for $9k so you can use in your van. i think these prices are quite fair, especially for a van with a very unique configuration of options (that would need to be special ordered to find another one like it with many of the options it has). per KBB, the same size Transit van in similar condition + mileage (but with $3k less in options compared to this one) sells for just over $30k. special ordering a new one with everything this has would cost $45k+ and take months to get. 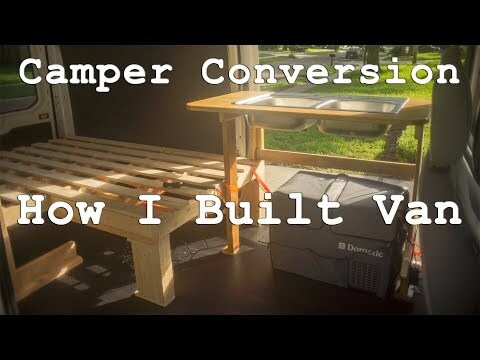 the camper build components + parts would cost a few thousand dollars to buy (not counting weeks or months of time and labor to research, build, and get everything to fit and work together in the small space). FINANCING — if you don’t have the cash readily available to use or borrow, i can help you come up with creative ideas for financing. for example, when i bought the van, i withdrew funds from CD savings and also did a 0% balance transfer for 18 months that only had a 3% transaction fee. this ended up being less than auto loan interest rates would’ve been. UPDATE 2019.02.19: i received a deposit for the van and the sale is pending until the buyer can make it down here to pick it up. the buyer is only purchasing the van empty so he can build his own setup into it. i spent last friday night and saturday morning on the blue ridge parkway south of asheville. it was nice and clear with plenty of stars above, and besides some cars occasionally passing by, very quiet. i remembered one of the reasons i got the van and how i really enjoyed exploring. the couple long days of driving no longer mattered when i found myself in the beautiful midst of nature. went to the arboretum this past sunday after installing the roof vent on my van. gratefully the dark clouds not too far in the distance stayed away and it didn't rain when i had an open hole on the roof for a while. Please share with anyone whom may be interested. i met a couple old friends at the arboretum this past saturday. when i was surrounded by nature waiting for them that morning, i remembered why i got the van. having a tiny home with me whenever i go exploring, especially to beautiful places, is certainly nice. it may be small, though being able to go on more adventures and longer journeys is pretty awesome. i've been so busy lately that i've barely taken it out wandering to new places. sometimes you just gotta get up and go regardless of whether everything is ready or not. after my friends left, i took a nap in the van and spent the rest of the afternoon in the arboretum. it was great to have a comfy bed with me rather than having to drive to one when i was tired. near the end of the day, it started raining and i got to experience how nice it was to be inside the van and simply be able to hop into the driver's seat without having to run around outside and get wet (like i would've had to do when in my truck camper). i spent the night in the parking lot at my friend's office, which wasn't too exciting but a place nearby i could stay undisturbed. sunday morning i decided to go back to the arboretum and spent the whole day there, again until when it closed at dusk. i drove to a quiet spot that was the furthest from the nearby highways and spent a lot of the day in the van with all the doors open, letting a breeze pass through most of the time. it was nice to experience having a tiny home in the middle of nature. i look forward to when i have my own land and a larger tiny home in nature for when i'm not traveling.